By 1988, The Guildford Four had served over 13 years in prison having been handed down life sentences. GERRY CONLON URGED Taoiseach Charles Haughey to take “a more robust attitude” with Margaret Thatcher regarding his case, saying the British Prime Minister stood on the side of “judicial terrorists” in a personal letter released under 1988 State papers. Conlon was imprisoned for terrorist activity as part of the Guildford Four case and spent 15 years in prison in the UK. He was one of four convicted of the Guildford pub bombings in the UK in October 1974, which killed four people and injured dozens. The bombings were in fact carried out by the Provisional IRA. By 1988, the four prisoners had served over 13 years of their life sentences. Conlon’s relatives – known as the Maguire Seven – were also convicted for supposed involvement in the bombings. In his handwritten letter to Taoiseach Charles Haughey, Conlon speaks of growing support for their case amongst Irish and British politicians as well as church leaders. In the years following their convictions, public awareness of the Guildford Four had grown. Baron Leslie Scarman and Baron Patrick Devlin – both highly respected British judges – were by then raising concerns about the case. 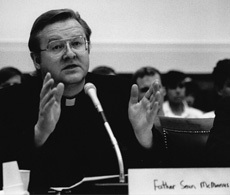 Conlon’s story would later be portrayed in the 1993 film In the Name of the Father. In his letter, Conlon questions why then-British Home Secretary Douglas Hurd believed there were no grounds for referring their case to the Court of Appeal. “Did he do it to protect the leading players in the case…?” Conlon asks Haughey. Referencing former Attorney General and Lord Chancellor Michael Havers, the judge in the Guildford Four trial, Master of the Rolls Sir John Donaldson and former Metropolitan Police Commissioner Peter Imbert, Conlon describes all three as “star performers” in the Maguire Seven case and of Conlon’s father Giuseppe who was convicted and later died in prison. At the time of writing his letter to Haughey, Conlon was awaiting a Home Office review into the case but felt that this investigation “will be another whitewash of the case”. The Birmingham Six were convicted for the Birmingham pub bombings in 1975 and also sentenced to life imprisonment. The Home Office review was based on a report by Avon and Somerset Police which provided new evidence in the case and later proved crucial. Conlon implores Haughey to “speak out on our behalf, and on behalf of the Maguire family and the Birmingham Six” and to take their case to the European Court of Human Right(s). [Margaret] Thatcher recently said “one is on either the side of justice or the terrorist”. Where does she stand regarding us then, obviously on the side of judicial terrorists. In July, Haughey’s private secretary responded to Conlon and explained the Irish government’s efforts relating to the Guildford Four and Maguire Seven case. Haughey had recently instructed the Irish Ambassador to “reiterate our concerns” to the Home Secretary about Guildford Four, the Maguire Seven and the Birmingham Six, his private secretary tells Conlon. The response says that the Irish government was awaiting Home Secretary Hurd’s review decision – which Conlon believed could be another “whitewash” – before taking action on his case. In October 1989, the Court of Appeal quashed the Guildford Four convictions, following the Avon and Somerset report. The court ruled that police had forged handwritten interrogation notes and withheld crucial evidence proving that the Guildford Four could not have carried out the bombings in 1974. Conlon, who consistently insisted that British police forced him into confessing to the bombings, was released from prison on 19 October 1989. “I have been in prison for something I did not do. I am totally innocent. The Maguire Seven are innocent. Let’s hope the Birmingham Six are freed,” he said upon his release. Fifteen months later, in March 1991, the Birmingham Six were released after their convictions were overturned.